"This is truly a fun and innocent game to play, even just to turn off the mind as the player stacks ordered cards. With bright, dreamy, colorful graphics of famous spired castles in the background, the stage is set for romance and challenges to the gallant, for ribbons, chains, bows and lockets, to be opened or held closed, as are lovers’ hearts. Cards is, after all a game invented in the courts of 12th century southern France, about the time of the troubadours and the beginnings of what we know of as romantic love. A variety of pleasing songbirds chirp musically as the main characters, the honor cards, the King, Queen and Valet, the eternal love triangle, tumble down onto the main deck with each mouse click. The elegant calligraphy and Middle Ages costumery are appropriately matched." Return to the world of Jewel Match in this beautiful Solitaire adventure. Journey across an ancient land to rebuild epic castles of old. Explore 200 levels plus many Solitaire variants including Klondike, Spider, Freecell, Pyramid, and more. Dozens of unique game play alternatives shake up your classic Solitaire with locked and frozen cards, obstacles to remove like vines and wax seals, and power-ups like wild cards, jokers, and shuffles. Search every level for gems and coins to purchase new castle upgrades and power-ups. 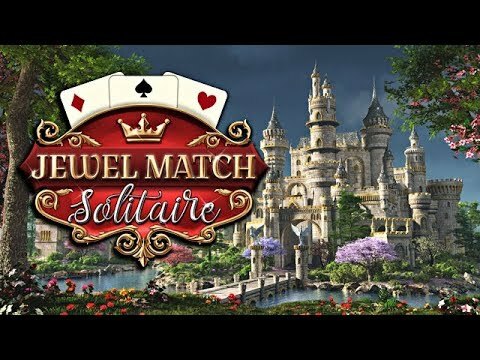 Jewel Match Solitaire is the ultimate relaxing Solitaire game.